Pressure cook dal with turmeric powder till soft. Cook bottle gourd in water till soft. After it is cooked, add cooked dal , salt and chillie powder. Bring it to boil. Heat ghee, add mustard seeds, when they splutter, add cumin seeds, asafoetida, red chillie, green chillies, ginger,curry leaves ,saute for a few seconds and add it to the bottle gourd. Bottle gourd dal is ready to be served. For this recipe, you can use either tur dal or moong dal. If you are using moong dal ,then pressure cook both moong dal and bottle gourd together. If tur dal is used, then you should cook tur dal and bottle gourd separately as tur dal takes longer time to get cooked than bottle gourd. Soaking dal in warm water for 20 minutes before cooking helps to reduce cooking time and also saves energy. Anapakaya pappu,a soft dish which every body likes. Super presenattion padhu and a delicious dal with bottle gourd..
Doll looks amazing. Nice recipe. Great presentation.. Love the combo of dal n bottle gourd. 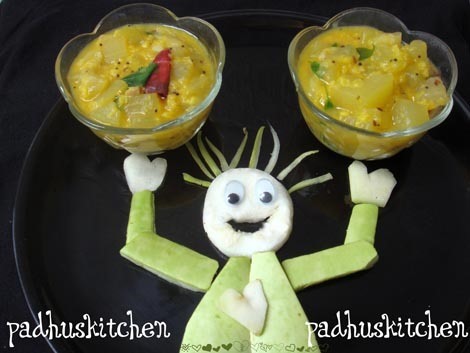 Bottle gourd man looks cute, nice recipe. Superb comfort dal. Loved the presentation,appreciate the artist in you. so cute presentation & nice dish!! Great recipe looks yummy and inviting. Do visit and follow my blog when you find time. A healthy one. Love the presentation. I love dal so much! I am eating some as I write this actually. I will have to try this recipe because I have never had gourd dal before. By the way, I am a huge Sidney Sheldon fan as well! Delicious kootu, love the presentation, very creative. thank you for stopping by Underneath His Wrapping. you have the most amazingly unique presentation of all.. so creative. the dal looks delicious.